Click on the left shopping icon for an instruction guide on placing a order online. Gotha skin cream combines ancient wisdom with the latest research to provide a cream which not only reduces the appearance of lines and wrinkles but penetrates deep into the tissues to allow the skin to repair itself. Skin not only looks and feels younger, it becomes younger. ReguAge is a new approach to skin care. It provides the proteins and amino acids needed to strengthen collagen which gives the skin improved elasticity. It works under the skin to reduce dark circles, puffiness and fine lines. In addition, it reduces the free radicals which prematurely age the skin. The composition of fatty acids in human skin is very similar to that of ostrich oil. This makes the absorption of ostrich oil into human skin faster and more effective. It is high in oleic acid, which increases its ability to carry active ingredients deep into the skin. Vitamin A increases the skin’s production of collagen and reduces the skin’s tendency, that comes with age, to destroy its own collagen. It also increases the skin’s production of keratinocytes (the cells that form the skin’s surface). The overall effect is glowing skin with improved elasticity. Vitamin E reduces the appearance of scars or blemishes on the skin. Vitamin E can also decrease the effects of psoriasis, erythema and dry skin conditions. Vitamin C is an antioxidant, which is proven to be effective in preventing the ageing effects of the sun on skin. The antioxidant properties of Vitamin C can also be used to reduce the harmful effects that smoking, excessive alcohol and stress place on human skin. Studies suggest that vitamin C may play a part in activating collagen metabolism and retaining skin’s youthful elasticity. Aloe gel cools and soothes the skin, evening the skin tone and reducing inflammation. When applied to dry, sun burned or damaged skin, it provides immediate relief and speeds up the recovery process. MSM is vital to build and maintain supple collagen cell walls in flesh tissues, using Vitamin C for tissue cell formation. MSM is required for the body to use Vitamin B5, Vitamin C, Vitamin D, Vitamin E, Selenium, Calcium, Manganese, and Co-Enzyme Q-10. When applied to the skin, MSM relieves leathery cracked skin, wrinkles, and skin itching. It also reduces scar tissue, moles, brown spots, black spots and provides relief for cuts, and burns. The combination of ostrich oil and active ingredients promotes deep penetration into skin tissue. Gotha cream treats both the appearance and the deep tissues of the skin to promote natural healing and rejuvenation. Promotes healthy, glowing, younger looking skin. Combines ancient wisdom with latest research for proven results. Skin feels better immediately and looks younger within weeks. 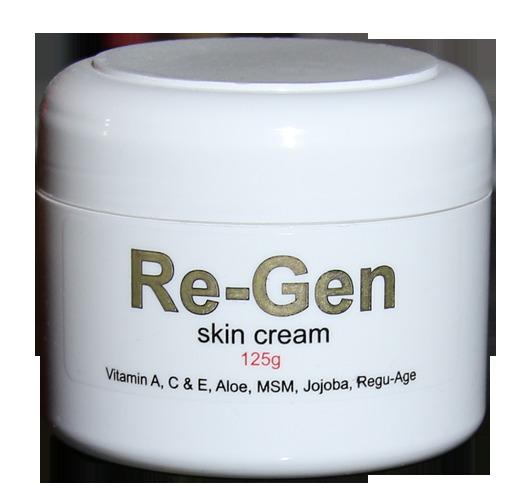 Skin regains youthful elasticity and produces more collagen naturally.